Eve's been shafted, that's for sure. She's been blamed for "the fall" of humankind - by sinning "first," "tempting" her husband, and corrupting sexuality. For those not familiar with the passage, God commanded the man not to eat fruit from the tree of the knowledge of good and evil in order to protect him from death (2:16,17). 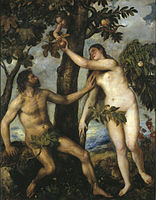 Eve, it is claimed, became the man's downfall when she ate the fruit and gave some to her husband. The origin of sin can be traced to her! To top it off, the curse passage (Genesis 3:16-19) puts the burden of painful childbearing and gender hierarchy on her shoulders as well. Ouch! Eve sure messed things up...or did she? Are we reading this correctly? Having already discussed how 1) the creation of woman "saved the day" when God saw that it was "not good" for man to be alone (the point being that we as male/female are made of the same "stuff" and therefore equal before God), and 2) believing that sin does not blemish God's image in us but rather we retain our relational mutuality and co-regency over creation even after "the fall," I believe a plain reading of Genesis 3 simply demonstrates the culpability of both Adam and Eve in disobeying God's directive. They are equal in creation, in the garden, and in their disobedience. The point of the passage is that they both ate, right? If anything, Adam is more "at fault" - if one is seeking to find a scapegoat, which I don't recommend. But for sake of argument, if Adam was supposed to be the "head" of his wife he didn't do a very good job of it. He was the first to pass the buck (v12); he was with Eve when the serpent tempted her (v6) and presumably could have intervened; and finally, he may in fact have "taught" Eve wrong about the command of God in 1:17 - although this last thought is a bit of stretch which I don't fully buy into. Nevertheless, it's interesting to note that God didn't tell the man not to "touch" the fruit, but Eve told the serpent that that was a prohibition (v2). So Adam seemingly dropped the ball in his "leadership role" (if that's what he had) when communicating what and why God gave the command in the first place. I guess my point here is that we're in this together. Sin happens; we're responsible. Adam/Eve, male/female, you/me - we've all eaten of the fruit. So it's not a he did/she did argument - it's a they did. Both sinned. And we sin. Although the "original sin" may have changed the dynamic between the sexes these untold generations, it's important to remember that this is simply a description of our current sinful state, not a prescription that we must follow. In other words, the resulting gender hierarchy that has subjugated women for thousands of years is not and has never been God's intent. Please believe me, not all Christians subscribe to a hierarchical relationship between the sexes - and in fact it is not a Christian position. The bible teaches equality, mutuality, interdependence. Eve has definitely been given a bad rap. Timothy! Tackle Timothy next! (Well, not actually *him*, he's been dead a long time...Paul's epistle.) I have read enough headship articles that ignore context and lay out bizarre rules; I'd like to read some equality articles that are carefully argued. Still informing myself about this. B, Done. But first, we'll look at "head" - the word headship already implies the wrong thing.